We’re more than halfway to the finish line! 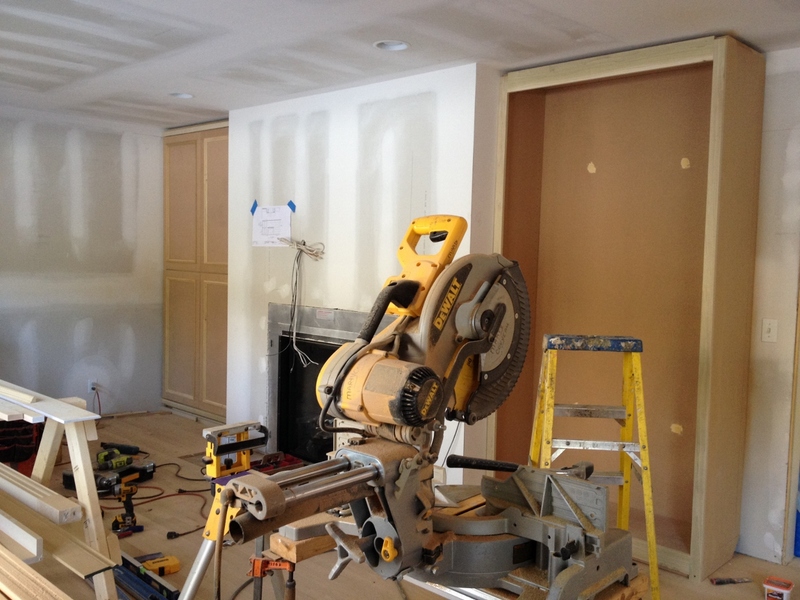 Week five of the remodel was really exciting, as all the work done was visible, so we were able to notice daily changes. 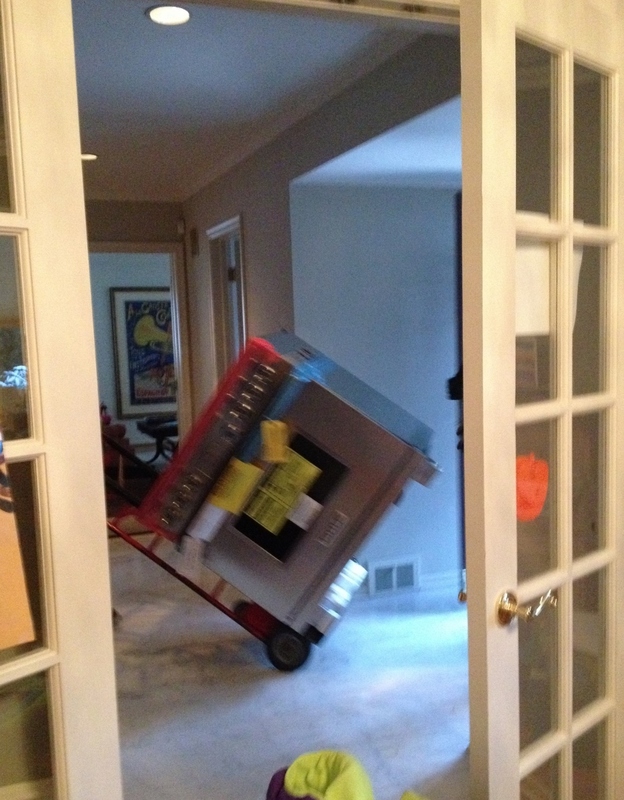 The appliances arrived Monday afternoon (my only shot of the actual delivery is blurry). 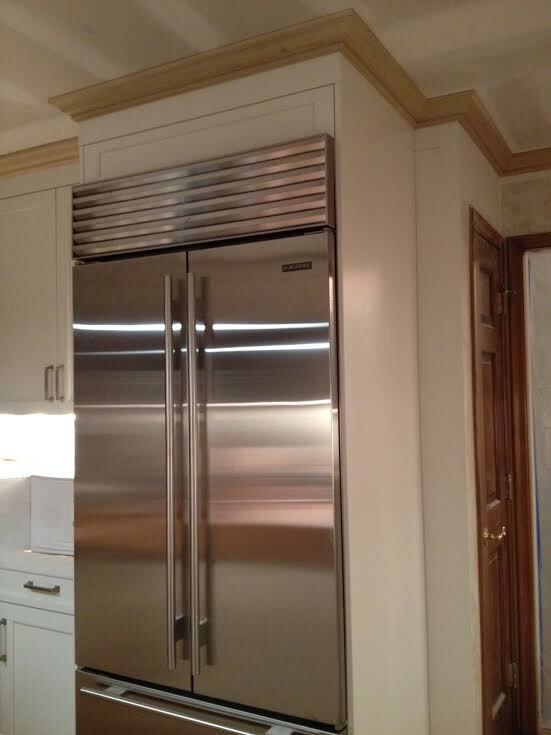 We settled on stainless steel appliances. It was a pretty easy decision. What wasn’t easy was deciding which brands and/or models to buy. We went back and forth over whether or not a high-end fridge and range were worth the investment and ultimately did spend the extra money (gulp). Wolf, please don’t let me down! 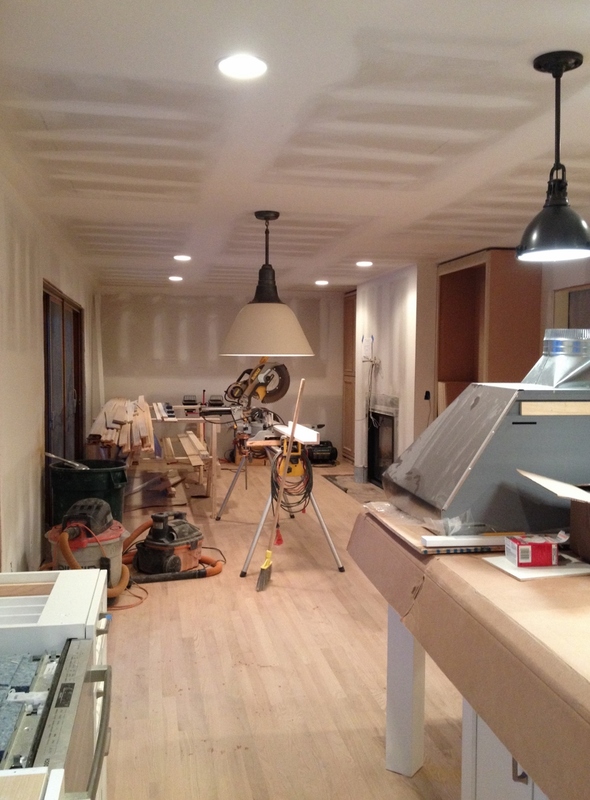 In the dining room, looking toward the kitchen. Looking into the dining room. The basement is through the hallway to the right. It was perhaps the most anticipated event of the week. Having a zipper means no more traipsing through the freezing cold (literally freezing – it was in the teens a couple days last week) and snow (!) to do laundry or grab something in the basement or take the dog out. Now we just zip, step through and we’re in the other half of the house (with access to both the basement and backyard via the sliding doors). 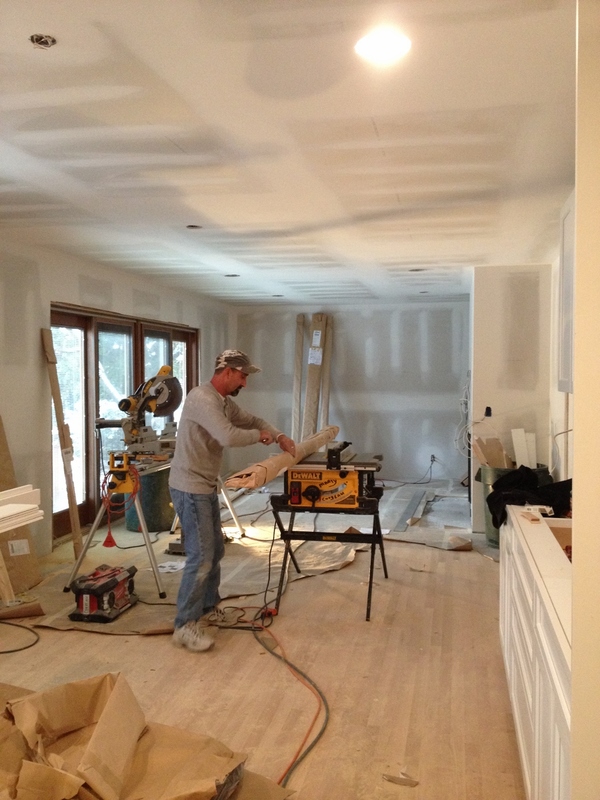 Marty was in all week (including over the weekend), working on various carpentry jobs. 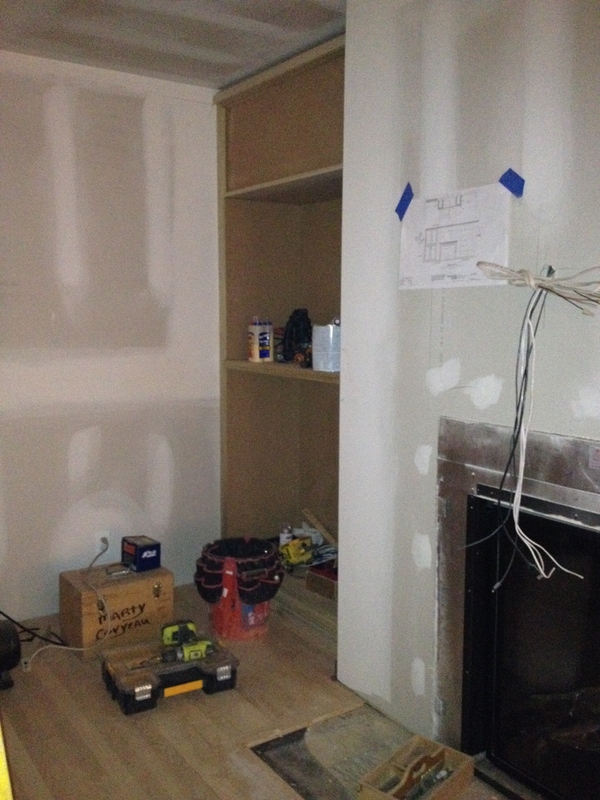 …and built the cabinets on either side of the fireplace. 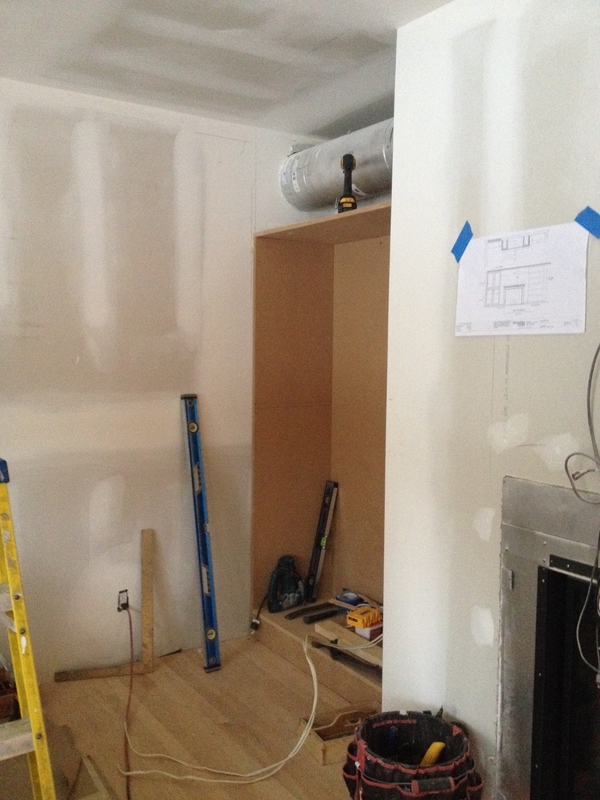 Initially, on the left of the fireplace, we were going to have a false door on the top half of the cabinet, but the flue ended up being higher than originally speculated. 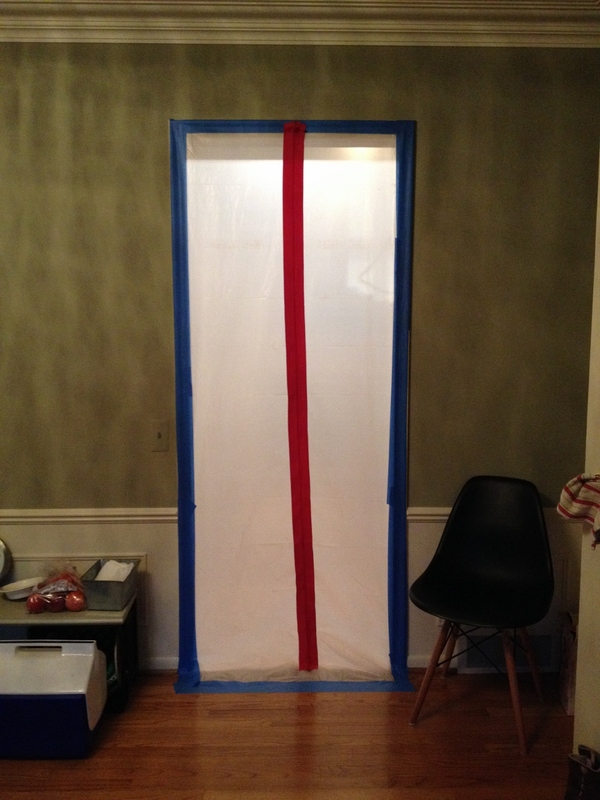 Thus, he was able to box in the flue, leaving us with almost two feet of storage space we otherwise would not have had. In order to center the fireplace, which was a priority for my husband (the family room was “his” room to design vs. the kitchen, which was “mine”), we not only had to sacrifice a few inches of space lengthwise, but we were also left with another symmetry issue, caused by the flue having to vent out through the side (there’s another fireplace directly opposite this one, in the living room). 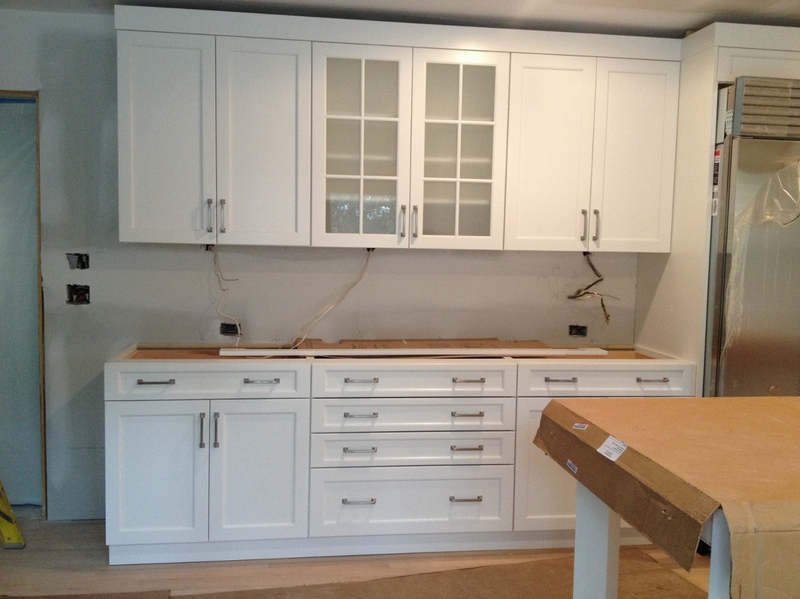 There were a few different choices including having two closed cabinets or no cabinet on the right of the fireplace. 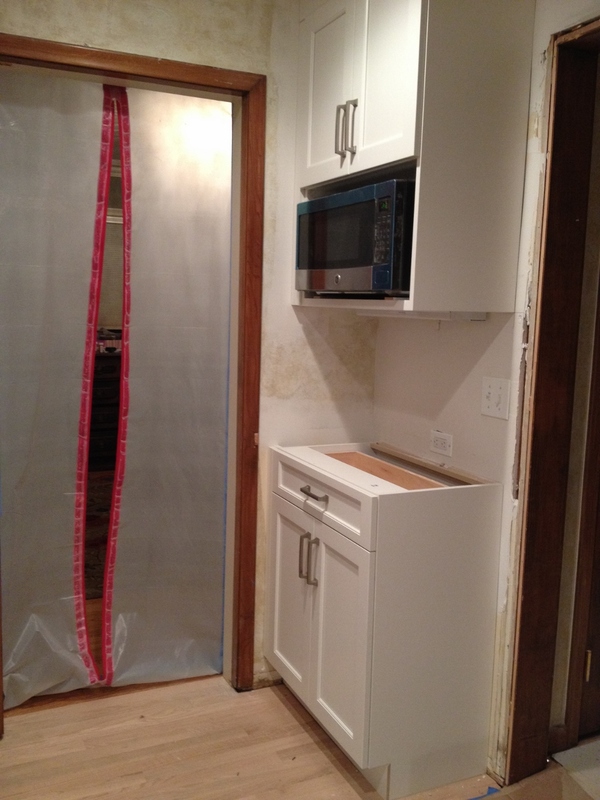 We thought about it a lot and chose the option that we felt was the best aesthetically. 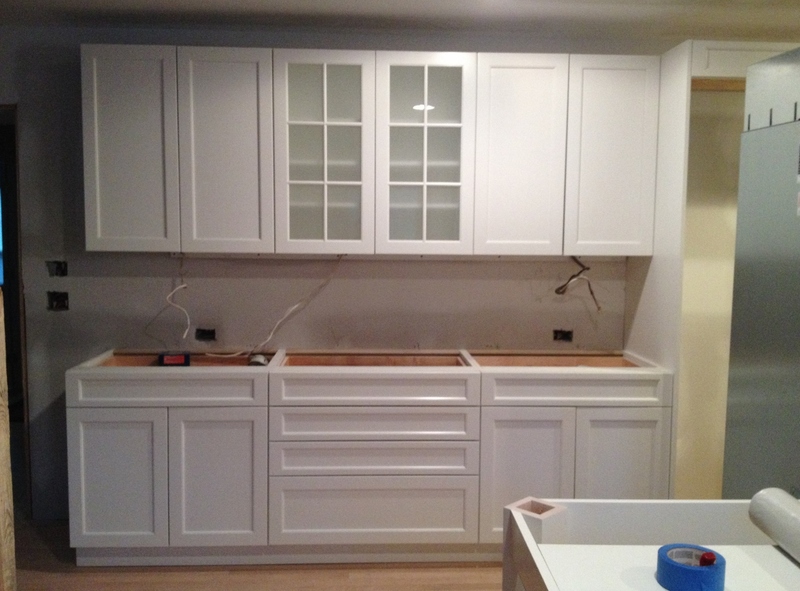 Hardware was installed on the cabinets (I went with one of three (?) choices of standard hardware rather than pay additional dollars for a different kind of pull). 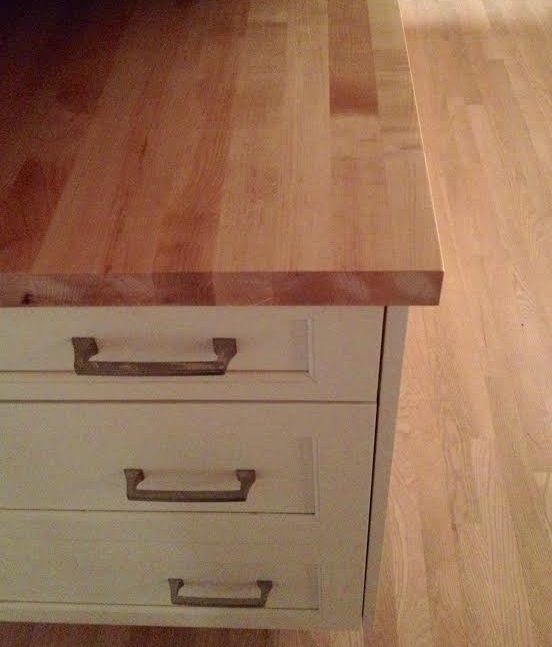 And the maple butcher block was installed on the island. 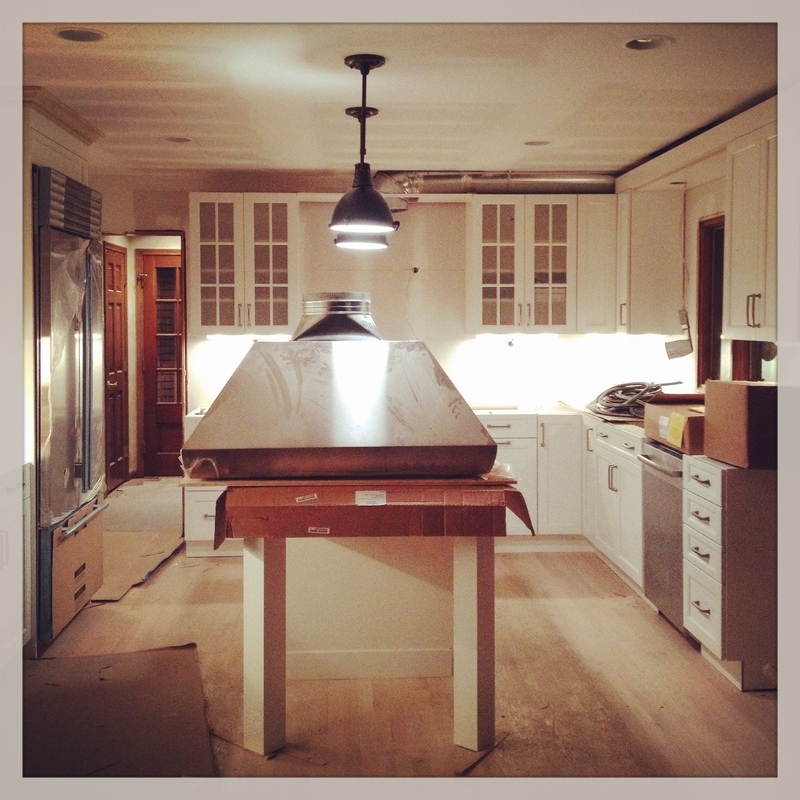 The lights over the island were put up. 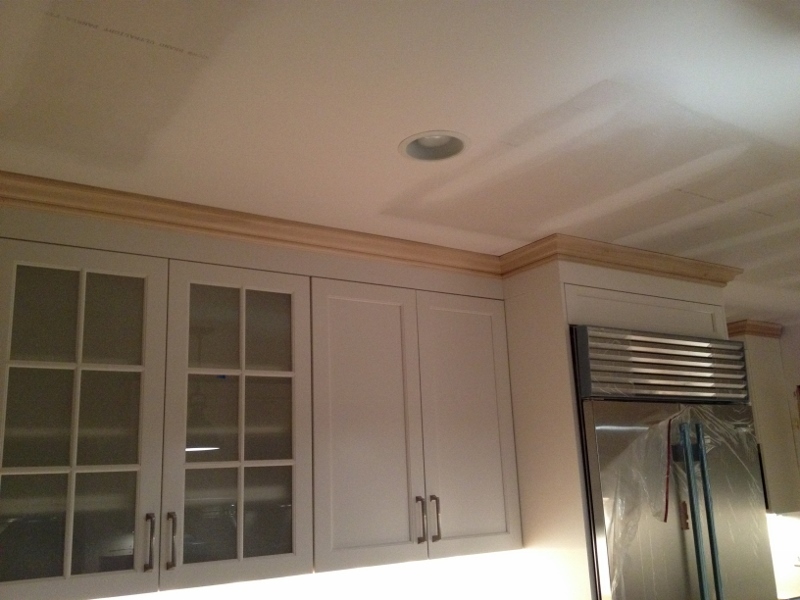 The electrician asked us if we wanted the longer rods or the shorter (he recommended the longer) and we chose shorter (and by we, I mean me, since the kitchen is you know, “mine.” I didn’t want anyone to bonk their head on the lights while cooking). After they were installed, I felt like they were too short (#favoriteclient), so they went ahead and installed the longer rod for just one of them, so we could be certain of our decision by Monday (for sure the longer!). It’s definitely a biggie. But I got the size that was recommended to me by the good folks at Mutschler, so I’m trusting that once all the furniture is down (and our new kitchen table will sit centered for the most part under the light), it won’t look so in-your-face. After the kids go to bed each night, my husband and I walk around the room and just take it all in (and of course find handles that are off center and fingerprint smudges on the white light fixture, etc). The decisions we’ve made are so far seem perfect. Fingers crossed that all the furniture we bought (most of which hasn’t arrived yet) will work with the space! 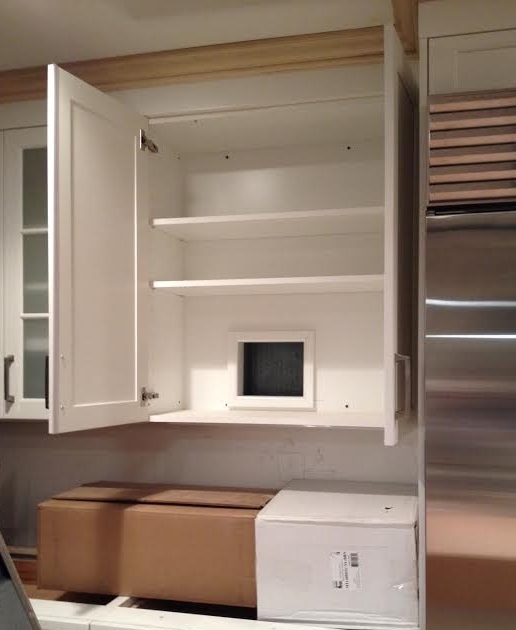 This entry was posted in Kitchen Remodel and tagged Cabinets, Carpentry, Home Improvement, Home Renovation, Kitchen, Kitchen Remodel, Kitchen Renovation, Stainless Steel, White Kitchen. Bookmark the permalink. It’s going to be a very merry holiday indeed! 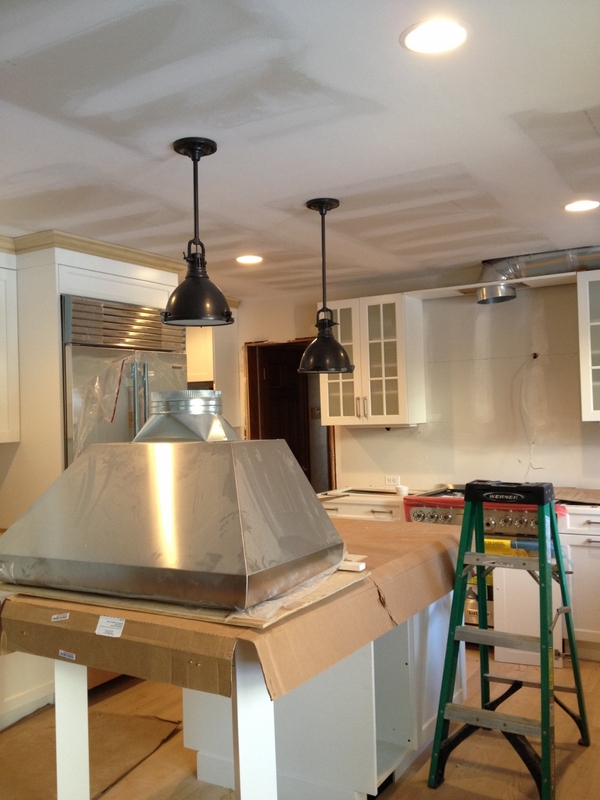 I love your choice of light fixtures!